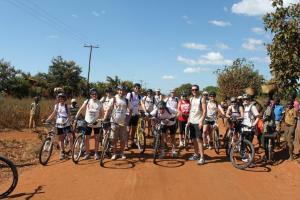 In May this year, Kayak Africa put together and supported the fifth Mission Malawi Cycle Tour. Mission Malawi is a biannual charity challenge raising money for HIV/Aids projects run by ActionAid in Malawi, Mozambique and Zimbabwe. To date they have raised over 350,000. Malawi is particularly hard hit by the Aids crisis almost 15% of the population is HIV+. Mission Malawi works directly with ActionAid so that all the funds raised go as grants directly to projects in Africa. This May, the participants cycled over 400 miles along dirt roads in central Malawi: from Lilongwe, to Nkhoma Mission, to Dedza Pottery, to Mua Mission, to Phirilongwe Forest Reserve, to Nanchengwa, ending off in Cape Maclear. The team visited ActionAid partners along the way who are working with people living with HIV and AIDS to see first-hand the difference they are making to people’s lives. Kayak Africa planned and ‘recced’ the route, provided the support vehicles, guides, tents, mattresses and all meals along the way.